Opera is one of many art forms that loves to dwell on what might have been. Nostalgia – wistful memories of the past; a desire to return to a former, departed happy time. It’s an emotion that has inspired some of the world’s greatest poets, whole folk music traditions are based round it – and it is also strongly felt in opera, perhaps most notably in Tchaikovsky’s Eugene Onegin. Operatic nostalgia is often associated with a particular place – frequently the characters’ distant home. In Puccini’s Il tabarro, the illicit lovers Giorgetta and Luigi sing of their adolescence in the lively Paris suburb of Belleville, while in Suor Angelica the young nun and former shepherdess Sister Genovieffa longs to hold a lamb once more. In Verdi’s Il trovatore, the imprisoned Manrico and Azucena sing a tender duet as they remember their peaceful times in the mountains, while in Aida the title character’s aria ‘O patria mia’ evokes her exotic homeland through a sinuous oboe melody. Yearning for the past also frequently features in opera. In their Act II duologue in Die Meistersinger von Nürnberg, Hans Sachs and Eva wistfully recall their former affectionate relationship: now Eva is grown up, things are more complicated. For Wagner’s Tannhäuser, nostalgia seems to be his dominant emotion: he spends his time in the Venusberg craving the simple joys of religion and nature, but once free he yearns for his former hedonistic life. Tannhäuser ultimately seeks death as a relief from longing; by contrast, Strauss’s Marschallin in Der Rosenkavalier uses her nostalgia for her childhood innocence to save the young Sophie von Faninal from a loveless marriage to an older nobleman like her’s. Verdi showed that nostalgia for the past can even have a joyous aspect, in Falstaff’s quicksilver memory of his boyish slim self, ‘Quand’ero paggio’. Some of opera’s most poignant evocations of nostalgia are not of the distant past, but of events that the audience too have witnessed. Elizabeth’s Act V aria in Don Carlo beautifully captures her recollection of her initial meeting with Carlo at Fontainebleau, through use of the couple’s tender Act I music. Similarly, the music of Mimì’s death scene in La bohème is chiefly based around that of her Act I meeting with Rodolfo, as Puccini evokes the romantic excitement of the past amid the sorrows of the present. 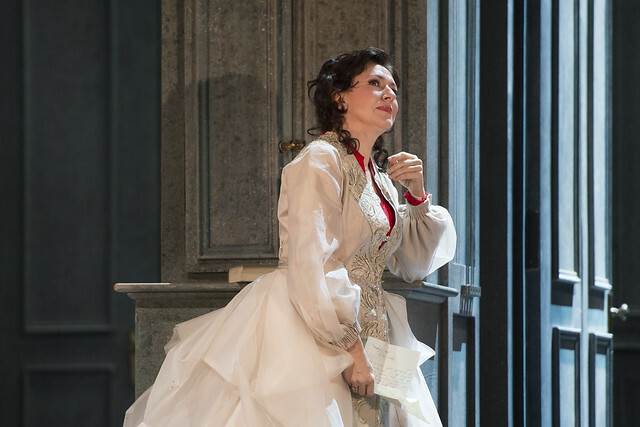 Violetta’s ‘Addio, del passato’ from Act III of La traviata is in the same slow waltz rhythm as her Act I aria ‘Ah, fors’è lui’ – longing for her absent lover replaces her former hope. In Act III of Werther, Charlotte has an extended nostalgic solo scene, as she reads Werther’s letters and reflects on their past happy encounters. Even the Marschallin allows herself a few wistful moments in the sublime Act III trio ‘Hab mir’s gelobt’ in Der Rosenkavalier, as she remembers her promise to relinquish Octavian if he should fall in love with a younger woman. Kasper Holten has described Eugene Onegin as ‘essentially about growing up and looking back – sometimes with regret’. An atmosphere of nostalgia permeates the opera. Madame Larina fondly recalls her romantic youth in the opening Quartet of Scene 1; Lensky laments the destruction of his romantic hopes in his exquisite Scene 5 aria; and, most poignantly, in their final scene Tatyana and Onegin quietly recall how ‘happiness was once so close’. The characters’ cherishing of their memories, coupled with their growing realization that they cannot bring back the past, lend Eugene Onegin its haunting power – and make it one of the finest examples in this art form that loves to dwell on what might have been. Die Meistersinger von Nürnberg runs 7 February–2 March 2017. Tickets are still available. Interesting and informative . Thank you for these insights.